We are now into Week 16 of Sharing Our World with Cee, a game I enjoy but seem to have become erratic in participating in. I am here this week, ready to go. If you had a choice, which would be your preference: salt water beaches, fresh water lakes, hot tub, or desert? Salt water beaches, to walk along with the girls and husband. I love the smell and sound of the surf, the feel of the salty air. What book do you think everyone should read and why? Still Alice by Lisa Genova. A poignant, beautifully written story of a professional woman who suffers early-onset Alzheimer’s, a disease that I think is the most frightening in this world. What’s your favorite way to wake up and what’s the first thing you do? My favorite way to awaken is to wake without any assistance, but that is something that rarely happens in my world, so my next-favorite way is with happy dog licking and pawing, telling me it’s time to get up and enjoy life. The first thing I do is feed that happy dog and her sister, then the cats, then I get my coffee, my iPad, sit in my morning room gazing out at the outside, reading email and blogs, and enjoying the fact that I have that quiet time. What do you to relax? Sit quietly with a glass of wine, knit, read, watch some TV – my current obsession seems to be house hunting on HGTV – or stream something older through Netflix on the iPad, listen to music. 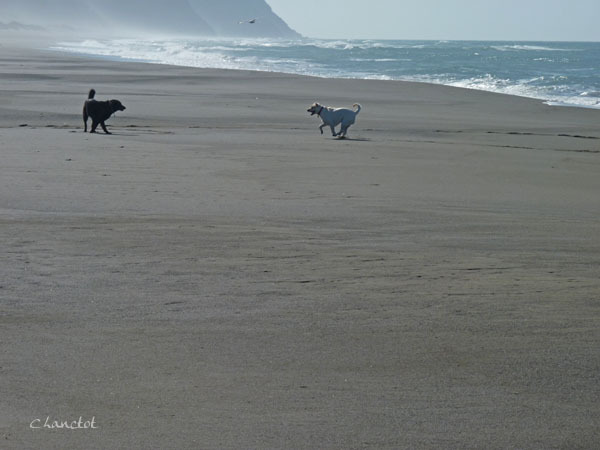 And now a few more beach pictures with the girls, all of which were taken on the beaches around Gold Beach, Oregon. We spent a few days there about 1-1/2 years ago – an absolutely wonderful wonderful trip. After dispatching the seagulls, another something to investigate. Really nice photos. Each one better than the next!–can’t choose! I’ll take them all! I like the fauna of saltwater, but I prefer playing in freshwater. I like the beaches best, too. Your girls look like they had a blast! 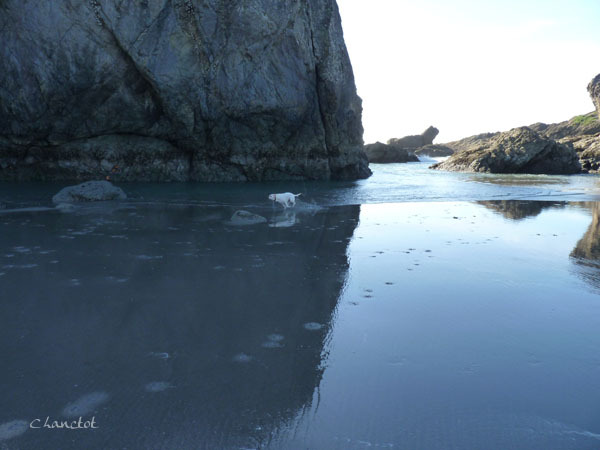 Ah, fun on the beach…love it. Shasta running through the water (the last photo) is especially wonderful. I almost got Alzheimer’s after reading Still Alice. Couldn’t remember anything for 24 hours. I am easily swayed. Great answers, Never read that book. I will have to check it out. Gorgeous beach photographs!!! I’ve always been a fan of house hunters!!! Salt water all the way! And when that’s not an option, a glass of wine and House Hunters International has become an acceptable relaxing alternative! 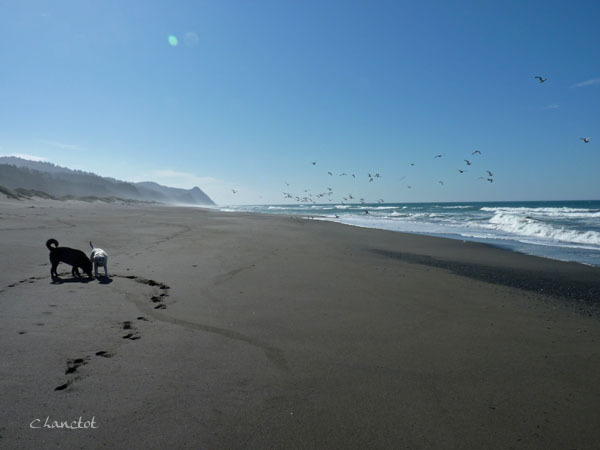 The photos of Gold Beach and area are just beautiful! You captured the magic of the place. 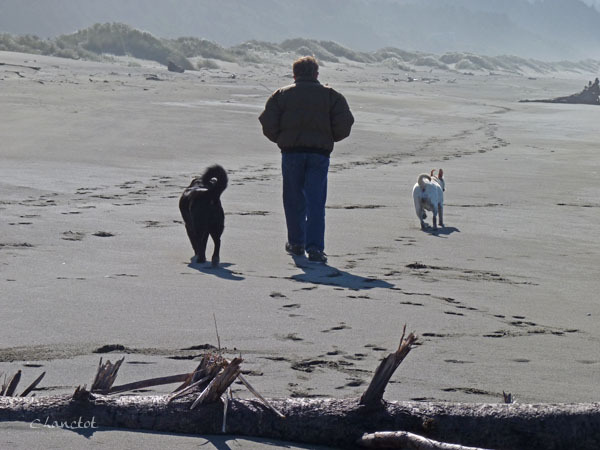 We try to stop along the Oregon coast as often as possible on our trips up to Vancouver. Love the pictures, it’s like being there. As for the book, I think it would scare me too much to read it, but on the other hand must be terribly fascinating.